A lot of people do not see the dire straights that Microsoft is in, Microsoft has failed and they don’t understand why. Worse yet, their strategies are reactionary, counterproductive, and utterly handcuffed by their past. The computing market is changing rapidly and it is to Microsoft’s detriment. They have a monopoly lock on the traditional desktops and laptops basically the middle of the market. That said, they are losing marketshare in the mid-market range, but very slowly. Unfortunately for Microsoft, this market is not growing, it is shrinking quite quickly. Worse yet, in the two computing markets that are growing, phones and tablets on the low end, servers on the high end, Microsoft is simply not competitive. As you can see from the picture above, and read the full story here, mobile is growing with stunning rapidity, and Microsoft is nowhere in that space. Despite spending billions of dollars on advertising, billions more to effectively buy Nokia, and throwing all their considerable monopolistic tactics at the space, it is eminently clear the company is at a loss for ideas in this space. By leashing Windows desktop to the failed phones, instead of building on the relative strengths of each, Microsoft has only driven away potential customers and weakened the position of both. Windows phone marketshare can be counted on one hand, even missing a few fingers in an industrial accident. 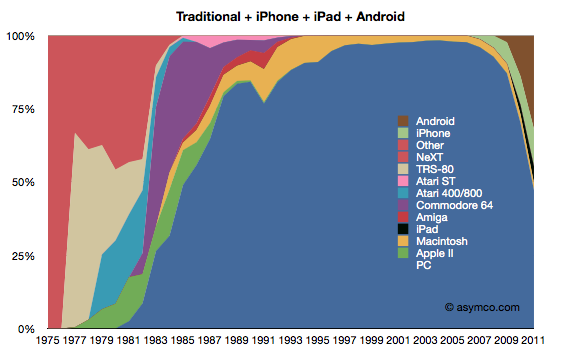 Tablets aren’t even doing as well as phones. Microsoft still doesn’t understand why. The other end of the spectrum is arguably in worse shape, marketshare is in the double digits, but it is plummeting. Server marketshare numbers are much tougher to come by, but web server share numbers easy to find. Servers in general are much harder to pin down, mainly because the market has changed radically in the last few years. The best public source SemiAccurate can point to is IDC, but that is revenue based, counts only traditional vendors, and while accurate for what it represents, is only a fraction of the total server market. Looking at the server market as a whole is difficult, however, conversations that SemiAccurate has had with industry sources in a position to know exact figures paints a clearer picture. When asked about it in September, two separate sources gave almost the exact same numbers. They both said that Windows Server marketshare across all x86 server sockets, not counting hypervisors as an OS, has gone from over 70% to under 30% in five years. Servers are growing rapidly, all those mobile devices need something to feed them data, and the Internet is not getting smaller. Likewise almost anything with the term cloud in it tends to expand at rates most companies can only dream about. All these things need racks and racks of servers to satiate consumer demand, and Microsoft’s share of this space is essentially zero. Microsoft is not in the cloud, and the cloud is eating the traditional server space with frightening rapidity. To combat this trend, Microsoft did something unfathomable, they forced their mobile UI on to servers. If this does not graphically illustrate how badly Microsoft management is out of touch with such a critical market, nothing will. It is not just a counterproductive move, it simply defies logic. Once again, Microsoft took a growing market that they were bleeding share in, and tied it to their new mobile UI that is widely detested among command line centric server users. This not only further weakens their server strengths, it also directly threatens their core desktop market as well. Throughout all of this, one thing has been sacrosanct at Microsoft, Windows and Office pricing. Microsoft has one line in the sand that it will not cross and this is it. List prices are not to be touched, if a customer balks, there are a variety of carrots and sticks to be used to sway the deal but the two main pillars of Microsoft profit, Windows licenses and Office licenses, don’t budge. Ever. 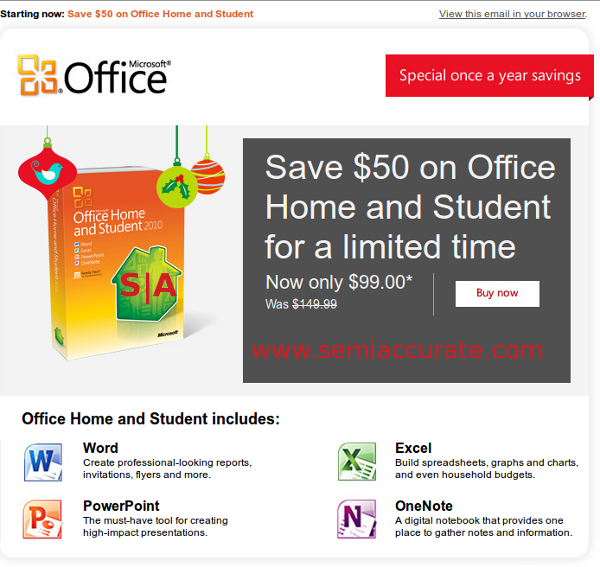 Throw in ‘valuable’ extras like training, support, installation, and even a few extras like online services or Sharepoint, but the core is full price. Some deals are cut, but they are strictly hushed up if not NDA’d, you will never officially hear about deals on the core products. Why is this important? Because Microsoft never crosses this pricing line, even in the face of mass enterprise defections over Licensing 6.0 a decade ago, they wouldn’t budge. Every trick in the book was pulled out, but the official price for Windows and Office licenses didn’t budge. Prior to that, and in the decade since, a hard line of official pricing was the only hard rule and nothing could change it, at least publicly. There have been VAR sales, there have been blowout deals by retailers as loss-leaders, and there are always kickbacks, MDF funding, and the like, but not officially from Microsoft. To do so would violate rule #1 and show the world that their pricing on the two lines that bring in the overwhelming majority of their income is negotiable. That would have a catastrophic long term effect on profits, and signal that Microsoft is out of options. For over a decade, they have managed to resist that eventuality. Then I got the email below, it arrived late last week on a list meant for large enterprise customers. Yes it is real, yes it is directly from Microsoft, and yes the purchase is directly from them, not a third party looking for foot traffic on black Friday.